This lounge is definitely the nicest lounge I’ve been to in the US, and it’s one of the best lounges I’ve been in period. I’d honestly say that it’s on par with some international first class lounges that I’ve been in. Upon walking into the lounge, I requested a shower room and a spa appointment. I had to wait a short while for the shower, and the lounge agent offered to announce over the PA when my shower room was ready. I wasn’t proactively offered a spa treatment, so you should ask if you want one, but I booked a facial since the wait was considerably longer for a massage. The shower room was large and had L’Occitane amenities. I had major problems with water temperature (it would alternate between scalding hot and freezing cold), but otherwise it was a good shower room. Walking around the lounge, I was surprised by how small the lounge is. It’s not a particularly large space, but it was never too crowded during the time that I was there. 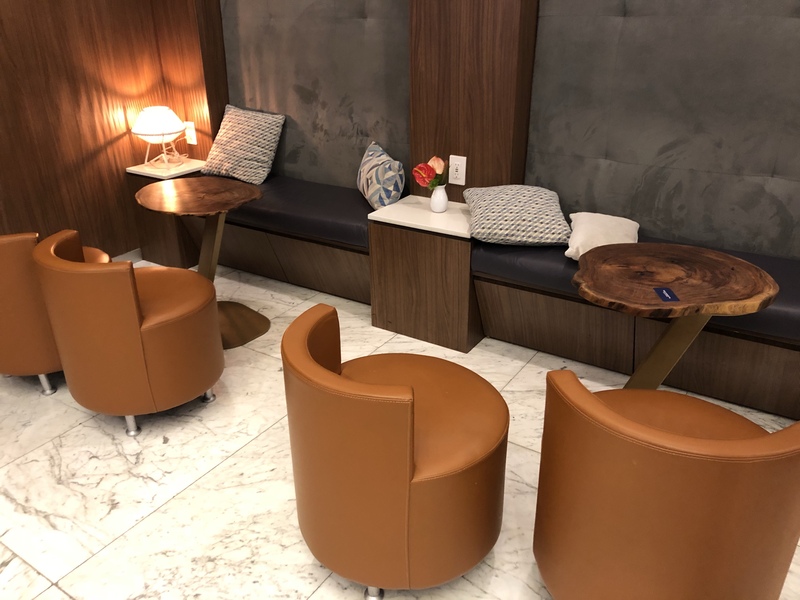 There are a couple of different areas, including a couple of loungers if you want to try to sleep, but the lounge is missing good working cubicles if you want privacy or need to make a phone call. The food selection was good, and the quality of the food was better than what you’d find at most airport restaurants. I found plenty of tasty vegetarian food to eat, and the signs were helpfully marked to say what was actually vegetarian. The bar also had a good wine and cocktail selection, and I enjoyed a glass of Moscato with my lunch. The part that really makes this lounge stand out was the service. Perhaps it’s because of the newness of the lounge, but everyone was quite helpful. I was asked if I needed anything multiple times, and there were servers roaming around making sure that people never had an empty glass. The service might not have been the most polished, but it was eager and attentive, which is more than I can say about the ANA Suite Lounge or the British Airways Concorde Room. Overall, I was really impressed by this lounge. It’s the nicest lounge I’ve seen in the US, they have some great amenities like free spa treatments and good hot food, and the service is friendly and attentive. I’m looking forward to seeing more Amex Centurion lounges open up in the future. You can get complimentary access to the Amex Centurion for you and two guests by having an Amex Platinum or Amex Centurion card. This entry was posted in Travel, Trip Reports and tagged amex, centurion lounge, dfw, travel, trip report on February 4, 2014 by Edward.